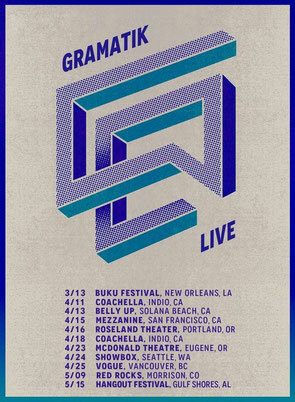 Coming off the ‘Leave Your Mark’ tour where he traveled the US and Europe for a host of shows, Denis Jašarević AKA Gramatik, recently announced his Spring Tour around North America, with dates through 2015. Starting things off in New Orleans on 13 March, where he is set to play the BUKU music and arts project, the Lowtemp label head will continue his tour through the West Coast where he is slated to play the already sold out, two weekend long Coachella festival. Continuing his tour through the Pacific Northwest and a visit to Vancouver, Denis will be capping things off at the Red Rocks Amphitheatre situated in the heart of the Rockies. After selling out the majestic venue last year, which draws in over 9,000 attendees, he will once again be joined by his Lowtemp crew and special guest, Cherub­, for the night. To give clubbers a taste of what’s to come in 2015, Gramatik released a recap video of his two-night sold-out stint at the Best Buy Theater in New York last month, which featured the likes of Goldfish, Haywyre, Freddy Todd, Slow Magic, Russ Liquid and many more.